On April 18th I posted 7 stories, though it wasn’t really as busy as that makes it seem, as four of these were really from the same event as it developed over around five or six hours, but it was still a long day for me, and one of those where the ‘logistics’ seemed almost as important as the photography. At the weekends we have engineering work taking place on the Underground, with some lines being part-closed, and it can make getting around London something of a puzzle to be solved. There is help on-line, particularly through the TfL (Transport for London) web site’s Journey Planner, though a recent update designed to help the casual user and those on smartphones has actually made it considerably less useful for me. The problem is that it can’t be relied on to give the right answer, and that sometimes you really need to ask a slightly different question, or split your journey into smaller parts to get the best results. Recently it gave me a route with three changes taking around an hour for a journey, and I looked at it and thought to myself that I actually knew a rather better answer as the two places were linked by a ten minute trip on a number 10 bus. Which I took instead. Though extreme, this isn’t unusual, though it does sometimes tell me that a journey I want to make is impossible. It is actually a useful site, but trying to deal with a complex set of networks – bus, rail, underground – and streets over a very wide area that are just a little beyond its capabilities. Though it can often come up with suggestions that I would not have thought of. One of my reasons for getting a smartphone is that I can also sort out my travel around London using it – though I now find Google Maps more useful that TfL on this. 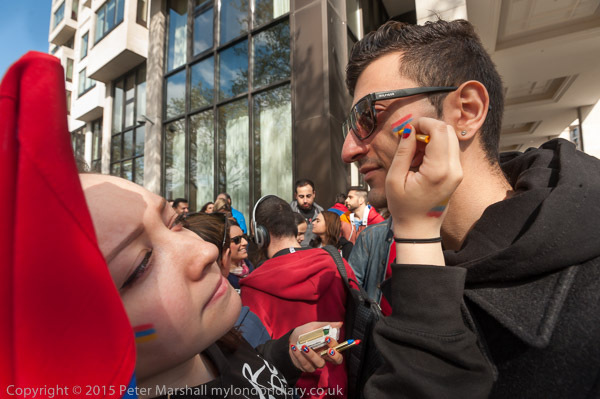 My first problem was simply that the march commemorating a Centenary of Armenian Genocide and a series of ‘flashmobs’ presenting the Football Action Network Manifesto to the offices of the main political parties were due to start at the same time but in different places. Even I have my limitations on that score! I decided I could start with the Armenians who were gathering on Piccadilly and spend perhaps 45 minutes with them before the start of their march (usually when things are most interesting) then rush to catch up with the football fans who had conveniently published the times that they would descend on the different party HQs. I would have missed them at the Labour Party, but should just be able to make it for their appearance outside the Conservative Party HQ. It should have been a fairly easy journey on the tube, walking from by the Hard Rock Cafe to Green Park, then one stop to Westminster and another short walk, but the Victoria Line wasn’t working. Given it was only just a mile to Matthew Parker St and I had just over 10 minutes I decided to do it on foot. It was a little warm for jogging with a heavy camera bag, but I made it in time, only to find nobody there when I arrived a minute before the stated time. It was advertised as a flashmob, so I waited, hoping for a sudden appearance as Big Ben chimed twelve, but still nobody came. I walked on to their next venue, the Lib Dems, 300 yards away and came upon them there, running around half an hour early and took some pictures and talked briefly with them. There were rather fewer than I (and they) had anticipated but they have some interesting views about the game and how fans are let down as big business dominates the game which you can read on their web site, along with the responses they got from the parties to their manifesto. 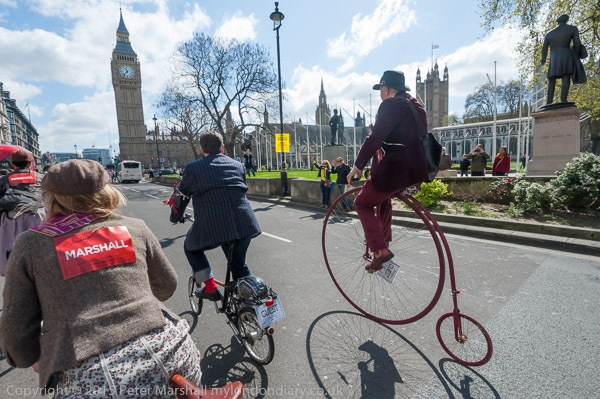 As I was talking with them and hoping to go with them to take some pictures in front of the Houses of Parliament, a group of strangely clad cyclists, some on vintage machines including ‘penny farthings’ stopped in front of use, and I rushed to photograph them. I’d not heard before of the Tweed Cycle Ride, and would not have gone out of my way to photograph it, but when something actually materialises in front of my camera I’ll usually take pictures even if it isn’t really my type of story. 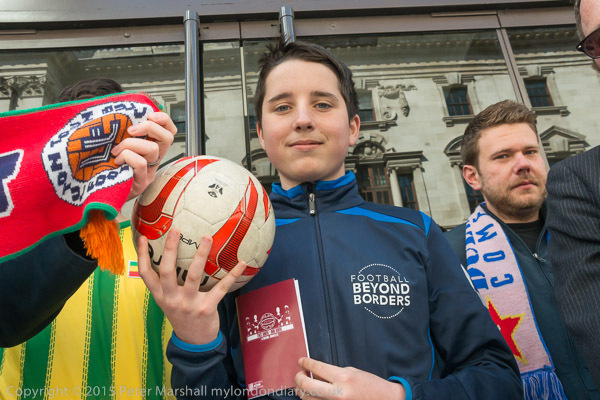 By the time I’d gone with them the couple of hundred yards on to Parliament Square – fortunately they were stopped by two sets of traffic lights – it was too late to go back and take more of the football fans. Because again I needed time travel. 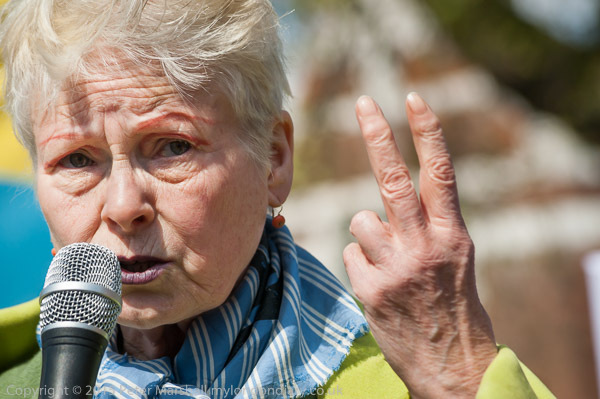 I’d been standing outside the Tory HQ at noon, and that was when the Stop TTIP rally was starting on Shepherd’s Bush Green. Shepherds Bush is four miles away from Westminster as the crow flies, but normally lacking wings I would have taken the Jubilee Line and changed to the Central Line at Bond St. But on this day the necessary part of the Central Line wasn’t working. I’d planned the journey in advance, with TfL coming up with several different routes depending on the exact start time, but it wasn’t quite clear which would be best. From Westminster I got on a west bound District line train towards Earls Court and I still wasn’t quite clear which way would get me to Shepherds Bush faster. Fortunately my phone could get a signal (it doesn’t on the deep tubes) and I was able to check while travelling that my best choice was to change to the Overground at West Brompton. It turned out I needn’t have been so worried. Although the event had been advertised as starting at 12.00, the rally didn’t begin until a couple of minutes after I arrived at around 12.40. It was a fairly slow-moving event, with a great deal of audience participation, people discussing the issues around TTIP in small groups as well as coming together to listen to speeches. 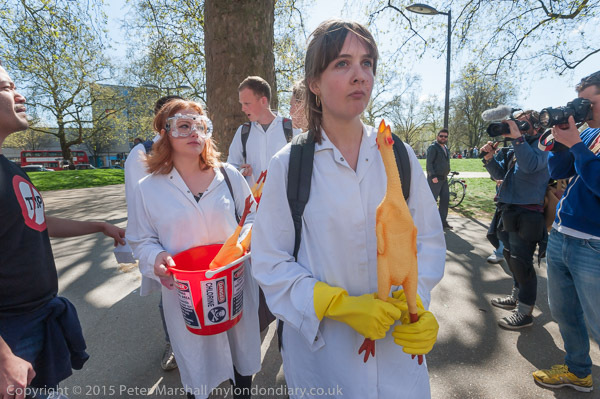 At the rally I was told there were going to be a number of direct actions following from it, and the first was immediately opposite, KFC protest over TTIP. I’d talked with and photographed the group in their white coats before this happened and had something of a lead over the other photographers when they made their way across the road for this, but the very narrow and busy pavement made it a difficult protest to photograph. Again, one of the protesters had told me they were about to go across to the other side of the green for the BP die-in against Climate Change. 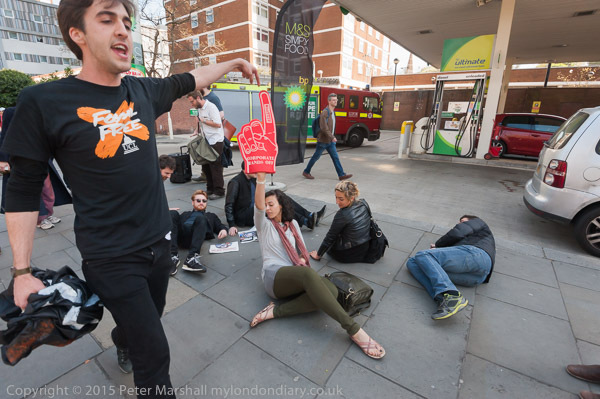 It was a little déjà-vu, as I’d photographed another protest at exactly the same location back in 2010 with Tar Sands Party at the Pumps, as well as dancing outside here back in the 1990s with Reclaim the Streets. I was tempted to leave as this protest finished but again I was told there would be more happening shortly, with a visit to the Westfield Centre coming up. I was a little apprehensive about this. Shopping centres are not photographer-friendly, and security at this particular centre had assaulted both protesters and photographers at a previous protest there. 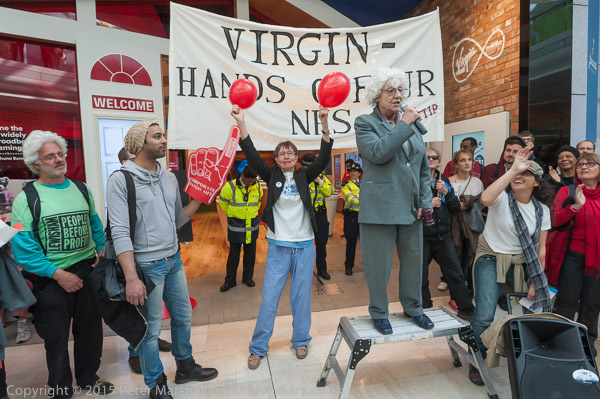 But in the event I had no problems, although at least one other journalist, a demographer, was told he must not film as the Westfield ‘Save our NHS’ protest began outside the Virgin shop. I’d been deliberately keeping a slightly low profile which was perhaps why I didn’t get approached by security at the same time, and shortly after I think they decided that so many people were involved they couldn’t really stop it. In theory you need permission to publish photographs taken in a private place – which such shopping centres are – but if there is a genuine public interest in doing so then journalists go ahead and do so, with little fear of any consequences. Though often security will lead you away should you try and do so. By the time this action had finished, I think both protesters and this photographer had had enough, and though there was some discussion of further protests, it was time for me to go home. With seven stories to write up and photographs to edit and send off (and of course a dinner to eat) it would be well after midnight before I finished. This entry was posted on Wednesday, July 15th, 2015 at 11:49 am and is filed under My Own Work, Photo Issues, Political Issues. You can follow any responses to this entry through the RSS 2.0 feed. You can leave a response, or trackback from your own site.